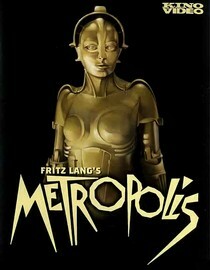 Metropolis is the first full feature sci-fi movie. It is a silent film from German director Fritz Lang and I was amazed at how well it hit on all the sci-fi movie staples we've come to expect. Set in a future dystopia where the poor slave away so that the rich can play all day? Check. An idealist steps in to save the world? Yes. Futuristic sets and intricate fantasy world? Absolutely. Robot strippers? You better believe it! I was amazed with how good the movie looked despite being made in 1927 and the director not having any precedent to work with. If you're interested in how movies evolved you should definitely check this out. The sets were amazing for their time and I wish there was a way they could clean it up so the intricacy could still shine through. Should you watch this though? If you're interested in film history, you're a real sci-fi buff or like silent films you'll really enjoy this. If not, well that's up to you. This review was written for the un-restored version of Metropolis. Click here to add the restored version of Metropolis to your Netflix queue. Why is it in your queue? It's the first sci-fi film made and one of the classic silent films ever made, I had to check it out. Is it artsy? It's old, I wouldn't call it artsy although your reasons for watching it might be. Best thing about the movie? The sets and the history. What mood should I be in to watch this movie? In a mood to watch a silent movie, possibly while stoned and listening to Pink Floyd.